Let your natural beauty shine through on your wedding day with glowing skin, lightly flushed cheeks and fresh-bitten lips. Choosing the right makeup and hair for yourself on your big day should be easy as you shouldn’t change too much of how you usually wear your makeup. Maybe it will be the first time that you wear a full white/cream dress so already you are out of your comfort zone. 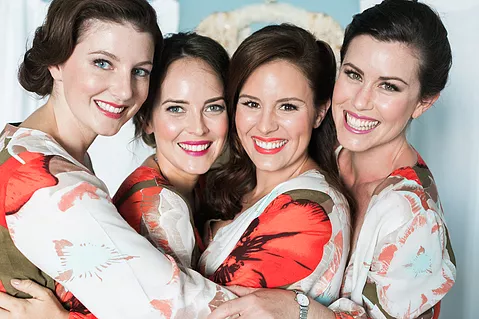 Your makeup should match the style you have chosen for your wedding dress if you have chosen a vintage dress it would be ideal to keep your makeup and hair in a vintage style. It is also important to take into consideration the weather as you will need to use different primers, especially in August in Spain as the weather is very hot. If your skin is naturally greasy primers are very important as this will help to keep the makeup looking its best for the next 24 hours. Your makeup and hair stylists can also give you tips on how to keep your makeup looking flawless for the whole day/evening. Although the bold lip is in trend for 2018, it is not a good idea to do this unless you are used to seeing yourself with a bold lip, I would suggest a lip stain. Your skin is so important on this day as you want it dewy, radiant and in perfect condition. Please contact me for my hair and skin regime which should be started asap, the better condition your skin the better makeup.